Feldpost (field post) letters are not a new source of facts about World War II. The basic facts are more or less well known. Feldpost letters have a different value. They are increasingly being recognized as documents of everyday communication. In the days of World War II, the Feldpost letter was about the only means of individual communication available to soldiers and their relatives and friends back home. Through the deployment of soldiers to far-away fronts, many relationships were torn apart. This included not only relationships between colleagues and friends, but also between parents and children and between spouses and lovers. Written communication was about the only possibility for contact. As a rule, the telephone was not available for private conversations, so letters, cards, packages and telegrams were all that remained. These were all transported through the organization of the Feldpost system. Occasionally other soldiers could take something back and forth as they were going home on leave or returning to the front. Estimates based on remaining invoices between the German army of that time and the German Post Office indicate that during World War II about 30 to 40 billion items marked Feldpost were transported. This inscription was generally sufficient for having the letters sent free of charge. In some cases their delivery was delayed temporally or locally due to the course of events of the war. The type of interest shown in these letters has changed over time. At first it was mainly philatelists who were interested in the standards and peculiarities of the ways of transportation. It was not until 1982 that interest in the content of the documents inside the envelopes began to appear. The first publication on this topic was written by Ortwin Buchbender and Reinhold Sterz. They published excerpts of Feldpost letters in a work called Das andere Gesicht des Krieges [The Other Face of War]. These excerpts were taken from the private collection of Reinhold Sterz, currently available in the State Library (Landesbibliothek) in Stuttgart. Until recently this was the only existing collection sufficiently extensive to permit comprehensive answers to complex questions. 1. "Write as often as you can"
The situation first changed in the year 2000, when Ortwin Buchbender persuaded Katrin Kilian and me to start another collection. The venture began in conjunction with the Museum für Kommunikation and with the support of the Technische Universität Berlin. Before long a considerable number of documents had been collected - more than 10,000 letters in over 600 bundles of series of letters that can be classified according to the sender. The special feature of this collection is that, in contrast to all of the other archives, it includes extensive information about the authors which enables systematic access and new evaluations. There are signs supporting the first conjectures regarding the importance of Feldpost letters as communications of love. It is possible to examine the hypothesis that "the lover who died during the war has a greater emotional meaning than the one who returned." Initially it could not have played a role for the recipient of the letters, whether to save them or not, because at the time of receipt it could not be known, if or when the loved one would be killed. On this level there is no difference between the surviving lover and the one who was killed. On the other hand, it is equally apparent that the memory of the two would be different. In the case of the lover who returns home, the matters discussed in the letters are continued and finally settled. This is also true in the case of the fallen soldier or the one missing in action, but in the latter cases the letters are a reminder of the person, as well as personal documents of a relationship that was ended through a violent death. The content of the letters themselves provides a special opportunity for commemoration of the loved one. Of 610 bundles in the Feldpost archives at the time of the evaluation (April 2003), 395 have a recognizable and recorded reference to the recipient. Of the 610 letter writers, 23 correspond with friends, acquaintances, or comrades (=5.8%); 157 with partners, some also at the same time with other family members (=39.7%; 2/3 of them were later killed in action); and 215 only with family members to whom they have a partner relationship (=54.4%; 2/3 of them later killed in action). Altogether and independent of the recipients, there are 370 statements regarding their whereabouts: 70% were killed in action or other effects of war or were missing in action. According to projections by Rüdiger Overmans , who analysed a representative sample of the 17 million record cards of the WASt (German department for notification of closest relatives of fallen soldiers of the armed forces), 28% of the soldiers of the army, air force, SS, or members of the Reichsarbeitsdienst, Organisation Todt, police, customs, state railway, post office, and finally, the Volkssturm, did not return home. According to Overmans 5,381 million soldiers were killed in action. In the Feldpost-Archiv Berlin 70% of the bundles of letters are from soldiers who did not return home, as opposed to the 30% who in actuality did not return. The distinctly larger number of letters in the archives from killed and missing soldiers, is a first clear indication of their remarkable emotional importance. In examining the content of the letters, it becomes apparent that those which serve as communications of love are actually perfectly ordinary love letters. They fulfil all the criteria and patterns known in the research on love letters. There are various themes that also appear in other communications of love, such as the declaration of love, the interest in a relationship, and clash over jealousy. In the framework of this analysis, there will be a concentration on themes dealing with the specifics of the Feldpost: war and relationships, the special problems in the communication of love in a time that seems to be coming apart at the seams, and on Feldpost letters as a special form of the communication of love. Individual aspects will be identified and illuminated with the use of examples. Lacking representative material, hermeneutics provides the only useful methodological procedure. The generalization of individual cases to larger groups of letter writers is at first purely hypothetical and can only succeed, if the selection of themes is plausible. II. "You can't imagine what it's like." The long separation, which in individual cases could last up to several years, caused by sending soldiers far away from home, caused not only problems in communication. Increasingly, mutual points of reference for exchange of information were lacking. Four different worlds in which the letter writers lived, can be identified: first, there was the world of the soldiers, consisting of the front or the zone behind the lines; then there was home, where the families and partners remained; there was the future and the past, which were constantly being referred to because the shared present was lacking; and finally, there was the world of media, which could suggest something like a shared synchronic experience. Say, Willi, in which section of the front are you right now? I listen to the news reports of the armed forces and the reports of the front every day. You can't imagine that because you are out there yourself, but for us at home it is a, let's say - a peculiar feeling - to know that out there in big, wide Russia a human being who you care very much about, is fighting against those fanatic Bolsheviks. There is another similar example below. The lack of information provided the soldiers' correspondents with no possibility for interpretation. They learned much from the newsreels, radio and newspapers, but the authentic reports from their partners had a much higher value for them. When the men wrote, their everyday life and what they did was apparently mentioned only marginally. Very naively the women asked questions about the front. They thought about their men and they wanted to imagine what their lives looked like. Frau M. called me the other day. She has not had any mail yet either, and heard from another comrade's wife, that you were in Donbogen. I can't imagine that. Please do me a favour and write as soon as possible. Where you are and what you are doing. The uncertainty is the worst. The questions from home regarding the soldiers' whereabouts were raised repeatedly, and the answers were vague. Censure was not the only reason for that. This Russian campaign is a story all to its self. One cannot describe it in a few words. I will tell you about my own experiences later. Many of the experiences in the realm of the war could not be expressed in words, especially not in a written form that would require more explanation. And in those cases, where the soldier was aware of this, he referred to an oral telling and the future. In 24 Jahren, Geliebte, feiern wir unsere Silberne Hochzeit! Viel, viel könnte ich Dir erzählen, aber das geht nicht. Das erzählt sich besser persönlich. Weißt Du, so mit Dir auf den Knien, in den Armen. So manches möchte ich berichten. Erfreuliches und (oft weit mehr) Unerfreuliches. Alles das aber würde als Geschriebenes eine Gefahr bedeuten. Es sind Geschichten für nach dem Kriege. Kein Geheimnis mehr, daß wir uns planmäßig absetzen. The letters from the front contained more summarizing assessments than details. The world of the front was a world onto itself. The soldiers had experiences that could not be compared with any others. There were no experiences here to which one could refer. In addition to being forbidden to state personal names, there were also very few persons in one's immediate surroundings known to the persons at home, and thus there were no common reference points. The consequence of this was that the letters usually contained only general hints. The letter communication served mainly as a means of maintaining the personal relationship. Since the anecdotal was lacking, many concentrated on assurances of love, common memories of past experiences and references to the future. There are numerous examples of letters in which the writers ignore the rules of censure and write surprisingly openly. These remain the exception, however. Only if one were absolutely certain that one's partner would read the confessions with understanding and treat them confidentially, and on top of that had enough self-confidence to disobey the censure regulations, was it possible to write concretely about experiences and deeds that occurred at the front and behind the lines. The village of Offerany is burning completely. The enemy is fleeing. The first company gets fire from a barn. Lieutenant Wendelhorn and three non-commissioned officers fight back. Two NCOs fall. Lieutenant Mantelboom sets the barn on fire. The Russians burn alive. The night is quiet. Battalion digs in. In the headquarters is Lance Corporal Samer, wounded. Radio specialists Doege and Lance Corporal Müller earned the EK 2 [Iron Cross]. 22.7.41 You ask how I am. Yes, Bobi, I can answer with a perfectly clear conscience, "wonderful." We only smoke "Attika," we get chocolate every day and a whole lot more. Of course, the smell of war is there, too. Life is somewhat irregular (such as, we couldn't wash for four days). Why doesn't matter. I don't really know anything to say about the general war situation because we don't get any information. I think when we are done here, the war will be about over. I just want to ask you one thing, don't get soft. Sometimes it isn't any different for me, but we have to fight down this weakness. Bobi, grit your teeth together and look straight ahead, to where with each sunset we are a little closer to reaching our big goal. We have to, and will, reach it, and you, our mothers and parents at home, must help a lot because every loving word, every greeting card gives us new courage. Even considering that a week has passed since the battle, there are indications that it was not yet digested. The "wonderful" appears to be more a self-reassurance because it stands in contrast to repressing the "weakness." Instead of reporting on his experiences, or passing on any kind of assessment or feelings, the soldier withdrew behind set phrases. His own doubts were repressed, and his own confidence was created or increased through the request to hold out and be strong. Bad news and bad moods were likely to be withheld. The portrayal in letters seemed to have more the function of compensating for one's own negative experiences than to lead a discussion with one's partner. For that the experiences were too complex and the descriptions too vague. The world of the soldier was separated from the world at home. Concrete questions were seldom asked. Participation in decision making was out of the question. Within the framework of social history, it is difficult to determine whether there are gender-specific differences in the communication of feelings. It is, however, possible to verify that letters written by women are different. Most obvious at first is that the letters from home were less subject to censure. Random checks of these letters were made, but for one thing, there were no military secrets to hide, and second, the possibilities for sanction were much more complicated. The world at home was known to the soldier at the front. In most cases he was torn out of his family and social surroundings involuntarily. He desired to continue to participate in this world. He repeatedly asked questions and thereby requested communication. The medium of the letter enable the man to continue a discourse with his family in spite of the spatial separation. Here it was possible for the letters to contain many details about the situation of the family and possessions. Among other things the letter had to replace the immediate experience. 31.8.41 These sweet children! You can't imagine how nice it is, when all three of them sit "in Mummy's bed" in the morning! What Ekki looks like, can't you imagine? Usually he lies there with big clear eyes, and when you come and look at him, it's as though the sun rises! And he always looks so cute, so sharp and sweet, that you have to catch your breath for joy. Indeed, there was not always only positive news to report. The women were requested not to spread around any bad moods, but according to mentality and individual situations, some women would not let themselves be prevented from describing their situations even including negative details. To the degree that the home front was increasingly burdened by the worsening supply situation, was increasingly becoming the target of bombing attacks, and finally, through the approach of allied soldiers became a front itself, these situations were mentioned in the letters that women at home wrote to their men. Gustav's sister on Kreuzberg has been bombed out. Everywhere you hear, it is the same thing. I looked at Paula's rabbits; she has about 6 little ones and one old one. I was supposed to drink coffee with her, but then I didn't have any more time because your dear parents were waiting for me with lunch. So I quickly ran home, grabbed my bouquet of lilacs that I had for your mother and then went to their house. By then Mother had lunch almost ready, but with the alarm, by that time it was already 2:30. So we could sit comfortably together for a few hours and talk about everything that had happened. Letters are an individual media. As Feldpost letters they also served as a communication about the organisation of the family and relationship. Much private information was reported. Gossip was also part of it because that is part of the exchange of social information. The Feldpost letters that were written from home could fulfil this function better than the letters that went in the other direction. The persons and places were known to both. Thereby the man who was far away could participate in the personal information. He was not able to contribute anything to the discussion because his own experiences were lacking in the private context, but he was not completely excluded. One feature of a relationship is that one is included in the gossip. As long as the man learns of the little things that are going on in his personal surroundings, he knows that he still belongs to the social group at home. The world at home could further be characterized by a phenomenon that one could call "daily waiting for the post." The post was delivered twice a day, and each time the relatives hoped for a sign of life from the front. They exchanged news; friends and neighbours joined in the joy, when a letter arrived and in the disappointment, when it did not. Often - content permitting - the letters were read aloud to each other. Since many people were in comparable situations, there was widespread understanding. The letters were collected. The motivation for saving them is not explicitly stated. One woman, who turned her collection of letters saved in a fabric-covered box over to the Feldpost-Archiv, did so with the explanation, "Those are all of my love letters. I took this box along down to the cellar during every bomb attack." Since one had to consider very carefully, what one took along in an emergency and what seemed to be needed for daily survival, it would appear that the letters had a very unusually high value. The fact that there are still so many letters in the families' possession and that many of them are being handed over to archives today, is evidence that the emotional motivation for collecting the letters must have been very great. Relationships that are maintained through letters have a past and a potential future. They are on hold for an indefinite period of time, and in spite of the separation, they are not over, but are put to a difficult test. Partnerships are determined by communication, which serves to bridge the separation. The problem is that love which cannot be realized by shared experiences can only be kept alive through the greatest mutual trust. Memories of good old times and hopes for better times are often used as arguments for not giving up a friendship in spite of a temporary separation. Since there is no shared present, references to the past are needed for consolation. Memory was used in order to alleviate the pain of the separate present. Aussee lies in a large valley. Leaving the village on the one side, one reaches Grundl Lake, a beautiful walk, especially when undertaken by a couple in love - but otherwise Grundl Lake doesn't have any special sights. Can you remember the golden fall leaves shimmering against the light above the mountain stream? And that I said the view couldn't be caught by the camera, and you proved the opposite? In general reference is made to positive memories. Romantic situations, in which one felt close to each other, stood for the pleasant aspects of the relationship. Reference to this memory implicitly pointed to the future. Just as it was before, so it should become again. 21.4.41 I was reminded again of the Easter holiday that we spent together in Altenburschla in 1939. Can you still remember? On our walk we also found cowslips that we placed on Mother's grave. It goes without saying that the situations called up from memory were conflict-free. The past became nostalgic, an emotional mixture of grief because that time was over and joy over the happiness and pleasure of that time. Beside the past and the future there was a short-term future in which the possibilities of the shared furlough at home and the time that could then be spent together was discussed, as well as a middle-term future in relation to the end of the war. This end was always imagined as being in the near future. A war that would go on for a long time was beyond imagination because communication by letter was only possible in a temporally limited framework. In their understanding the partners were only using the communication by letter temporarily. Even in cases where the separation had already gone on for awhile, in their consciousness the separation would end soon. Looking for a time frame one repeatedly encounters the subjective, but hopeful "soon." The future was the time after the war. The present was not eliminated, but was experienced as an interval that one had to live through in order to continue where the nostalgic past was interrupted. The war has to end sometime! My thoughts now are so often with us in Detmold after the war; now all of that has taken on colour and form whereas for awhile in between it had become pale and distant. I have such a strong feeling that something dark was hanging over us like a heavy cloud and that now we've gone through it and the sun is shining again, and everything is good again and will get even better. The future was hope. Separation - and thereby the present - was viewed negatively in this regard. 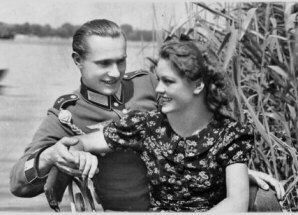 Since the present was determined by the war, among married couples and couples in love, there are very rarely positive remarks about the war. It was seldom questioned ideologically or principally, but rather it was experienced as the interruption of private happiness to which one yearned to return as soon as possible. 20.10.41 I can already see us in Athens and I am looking forward to it so much. Altogether I am already living very much in the time after the war. Everything should be wonderful then! Due to nostalgia and hope, the past and the future were idealized. Through the medium of letters, an ideal image was created that was preserved in the case of death. This state of affairs probably contributed to the fact that the letters of deceased relatives were more likely to be saved than were those of home-comers. In the latter cases everyday reality soon overcame the romantic images. The idealized content of the letters fostered the idealization of the soldiers killed in the war. In addition to furlough and letters, the mass media were the only possibility for shared current experience independent of the separate worlds of home and the front. Feature films produced in the Babelsberg film studios were shown not only in the cinemas at home, but also in many locations where German soldiers were stationed. They were a popular pastime both at home and at the front. Newspapers, magazines and books (for example, the Feldpost series of the Insel-Verlag) could be sent everywhere and were very popular among soldiers. In this way participation in public discourse was possible. Radio was the only live media that could be heard at the same time on all parts of the front and at home. The synchronic reception united those who were separated. Of special interest in this regard, is the radio programme Wunschkonzert which for a small fee enabled listeners to request music and send greetings to other listeners. In many of the letters there are references to this programme. The partner is often asked if he or she has heard a particular passage. The referendum suggested in the speech was held. Irene shared her interpretation of the speech with her husband. He had a chance to hear the speech, as well as the repetition on Feb. 21 before he shared his opinion of it. Today I received your letter of Feb. 19. Yes, it sounds like Jupp Goebbels gave you all a shock. I must say, he was damned clear. I listened to the speech again on Sunday morning. You could almost say all of the Berlin Tiergarten was unleashed. He won a lot of sympathy for himself among many of the front-line soldiers. It is safe to say that this man earns his money. Most people seem to think that he is also good in his field. Ernst was much more reserved in sharing his opinion. He did not contradict Irene. He confirmed her opinion by giving his estimation of the effects of the speech. There was no discussion of the content. When Irene answered, she referred to the speech again and gave a concluding aesthetic judgement. Yes, my dear. You also heard Goebbels' speech? Yes, my dear, wasn't it brisk? I listened to it again on Sunday morning. Through the media events, synchronic experiences were possible. Additionally, the aspect of the aesthetic judgements was important for relationships. Everyone more or less has their own opinion and their own judgement, but discussions about opinions are very important and play an important role in everyday communication. Aesthetic judgements are spontaneous assessments of perceptions. They serve to ascertain, whether the partner views the world in the same manner as oneself. Similar judgements exclude the necessity for searching for commonalities. The more the partners form similar aesthetic judgements, the fewer arguments can be expected, and cooperation is simpler to achieve. Reconfirmation of shared opinions is an important part of communication within a partnership. Since it is only possible to reach mutual assessments based on shared perceptions, media events play an important role. The medium of the Feldpost letter brought a stabilising effect into the aesthetic discussion. It was very difficult to carry on the debate over a changing attitude. During conversation there is the possibility of trying out arguments and then changing one's opinions. If they do not come across as intended, they can be spontaneously revised again. By contrast, written material is committed. The written word carries more weight. There are also further limitations: transportation took a long time and was uncertain. The letters did not always arrive in the order in which they had been written. Arguments, not to mention fights, were difficult to carry on by letter. Thus it was generally easier to continue along the way started, than to communicate to change it. Since one could not assume that one's partner had changed his or her mind, one tried to use written communication to reconfirm the known opinions. In this way the whole thing became a self-referential system. III. "I have already applied for furlough." Furlough was the only possibility for maintaining direct contact without relying on letters and telegrams. Love without meetings has almost no chance in the long run. During the war, meetings between soldiers and their wives and families were limited. As a rule there was home leave twice a year, 14 days each. This concept sounds a little old-fashioned for modern standards. Vacation is something that takes us to another place and we spend some free time there with a loved one. During times of war, furlough was the time which soldiers were allowed to spend at home. I have already applied for leave. I have been given 21 days. More than that is not allowed at one time. When this furlough is over, if my legs are not the way they should be, I am supposed to apply for furlough again. Later, after my recovery, when I am with a substitute unit, I will get my year's leave (14 days). Becker R. is leaving tomorrow on 14-day furlough. In addition, there was convalescent leave for illness or injury and special furlough for a death in the immediate family or other emergency situations. There was no furlough for births. Birth announcements and other news within the family had to be conveyed by letters or telegrams. It was not possible to plan the dates of regular furlough in advance. There was always something spontaneous about it. With the irregular distribution of furlough, I can't begin to say when it might be my turn. Right now it looks like it will probably be late autumn though. I can't say that I really want to go on leave now because returning would be too awful. By now I have gotten so used to the deprivations that I hardly notice them any more. When you go home on leave, you start to notice again that more exists in life than Russian dirt. And then it's much worse to go back. I would really rather go home during the winter because I am most afraid of the winter here. Furlough was one of the main topics open to debate over its current status. The lack of knowledge and insight into the general military situation caused uncertainties that required interpretation. A common theme of the letters was passing on gossip about the system behind the distribution of home leave. This was discussed not only between the correspondents, but also among the soldiers because it was a problem for everyone. 4.5.44 There is supposed to be a new order coming out in the next few days guaranteeing married men home furlough every six months. That would be nice because then I could hopefully be with you again by October, darling! Just think! My unit did not count the three days of additional leave last time as part of my regular furlough. Isn't that wonderful? There you can see what a good deal I have here. Furlough was a constant theme in the letters. Every conjecture, every change and every hope is communicated. However, furlough also caused problems because happy experiences left memories that were often difficult to bear. 16.6.40 You would like to know when I will next get furlough. Right now I don't have any idea, but I would also gladly give up my furlough if it meant I could return home sooner for good. Furlough was a poor substitute for what the soldiers really wanted. They wanted to return home as soon as possible to stay. The temporary break in separation made the continuing separation more difficult to bear. Christmas will be sad this year because I am no longer counting on Christmas furlough. I cannot express in words how sorry that makes me. I am suffering that in silence, too. I do not feel like talking much anymore anyway. The negative feelings connected with involuntary separation were particularly intense during those times when families were normally united in harmony. Christmas was the most painful holiday when not celebrated with the family. On those days the separation was experienced most intensely. 25.1.40 Everything has to be taken care of very fast now, or there will not be enough time and I will not receive furlough. In any case, please find out how long it takes to put up the banns for a soldier without a notification from his battalion that they are going into the field on a certain date. I don't know, if I can get one. It was not even a certainty that a soldier could get furlough for his own wedding. For this reason, in November 1939 marriage by proxy was introduced, permitting soldiers to be symbolically present in their home town city hall with a photo, helmet and sword. Not even the telephone or wireless was needed to learn the mutual will of bride and groom. A declaration of intent to marry given by the soldier to his battalion commander was sufficient. In some cases even a simple written note of consent by the soldier was adequate for marriage by proxy. Now there is furlough. 2% of every unit can go at a time. Accordingly, it will be my turn in 1945. - In a parody of "Lili Marlene" there is a song that goes, " and when it's my turn for furlough, I'll practice population politics with you, Lili Marlene!" Cynicism and parodies provide possibilities for coping with undeterminable situations in uncertain times. Humour can trivialise unpleasant facts and at least verbally can reduce their importance. One acts as though one had recognised the problem and had it under control. The granting of furlough was somewhat fateful. Neither the timing nor the distribution criteria were comprehensible. On top of that, there was always a nightmare hanging over all of them - cancellation of furlough. Even when leave was granted, if the military situation demanded it, approval could be withdrawn at any time. IV. "I had death in my pocket." One theme that in other forms of communication of love is likely to be an exceptional topic, was a constitutive component of Feldpost love letters. The possibility of one's own death enters the communication. Love, death and war are brought into relationship with each other. 2.9.41 You and I, Bobi, we have become one. You do not know how thankful I am to you. Our love, that belonging-to-each-other, has let such deep roots grow in our hearts that nothing can ever happen to separate us. Why should it? Only this war would even have a chance. Through his journal entries we know that Ernst had various experiences with death in the course of the Russian campaign. Comrades were killed or wounded. This experience was so basic that he refers to it in a letter in January, 1943. 26.1.43 Just think once of the past winter, of January. Recall your thoughts of that time and compare them with your thoughts of today. No, my dear, don't do that. It would be terrible. I had death in front of my eyes for five months, and I escaped it. Today I can say that sounds like a fairy tale, but that is how it was, and I cannot forget it. You know, I often tell myself, I had death in my pocket, in my haversack, but I didn't let it out. Oh, well, that's over. We have each other, my darling, and I buy things again and wrap little packages, just like in 1941, as though nothing had happened. The possibility of one's own death remains present. One can view Feldpost letters as a sign of life simply showing the partner that one was still alive at the time of writing the letter. At the same time, every letter was potentially a farewell letter because one never knew when and under what circumstances death might overcome one. Finally, the Feldpost letters were the communication of deeper content. In this letter written at the birth of his second daughter, Ernst makes a connection between death and birth. He transfigured both occurrences with the intention of creating something in common with Irene. This commonality was for him proof of his affection and solidarity in the relationship. This birth was interpreted as a continuation of life, perhaps even his own life. It is clear that in a time when one's own life and the safety of one's partner were not to be taken for granted, death was perceived as a threat. At the same time it was idealised as a hero's death. "Fallen for Fuehrer, Volk and Fatherland" was a set phrase that was soon being used in every family. In this way it was easier to deal with death as a personal experience. This form of putting it at a distance made its threat easier to bear. V. "Is that right? Or is it too much? Do you want to know more?" Other phenomena in connection with the communication of love and Feldpost letters were the special roles of men and women. The absence of the husband forced the wife to take on new duties and responsibilities. Conscription separated him not only from his wife and family, but also from his profession, job or business. Unless his job was categorised as being necessary for the war effort, no exceptions were made and he was conscripted. The work he left behind was not necessarily completed. Customers waited, bills had to be paid, taxes had to be paid. Is that right? Or is it too much? Do you want to know more? The husband lost his possibilities for working and sometimes also for making decisions. The wife who prepared this calculation was not sure of her role. She hesitated to make decisions, wanted reassurances. Communication between the partners was repeatedly determined by business-related matters. It is worth noting that the distribution of roles was not questioned. The wife did not act on her own, but rather as a helper of the decision maker who was not present at the time. She substituted for him as best she could. 13.12.44 If I hadn't been so afraid of making the trip or of getting into more air raids, I could have brought more things here. But I couldn't have brought everything anyway. I sent Mother to the Post Office and the Local Branch Leader right away, and she is going to send a telegram to you. Hopefully they will at least let you come home then. Even if everything is in Asia, you could at least help me with some things. There are still some things to be taken care of that you can handle better than I can. It is a rather strange thought: the husband should come home at the end of 1944 in order to take care of errands in connection with bomb damage. Certainly the wife should have been able to handle that herself, but in her desperation she wanted the support of her husband. It is also possible that the bomb attack was just used as an excuse to help her husband get home leave. Considering the situation of the war, this was an attempt to get her beloved husband closer to her. Although the wives had to handle almost everything self-responsibly and in most cases they did this, it did not change their ideas about their role. They did the work because they were forced to do it. They took on the responsibility but only against their will, and as soon as possible they gave it up again. From the viewpoint of the men there is an analogous image. They also had their expectations and demands which were equally oriented on traditional behavioural roles. Please give little Albert all of your attention and watch over his upbringing carefully. Please always be loving and kind to him, but also strict and upright when he makes mistakes and displays bad habits. Please get him used to order, cleanliness and obedience. Those are all things that you must pay attention to. Please make sure that he prays regularly, every morning, afternoon and evening. I am certain that you are doing that anyway. Please do not hold it against me that I have mentioned it again. The upbringing of our children is one of the most important duties that we have. The father Alois was concerned about the upbringing of his child. His absence prevented him from participating in it. In spite of that, he had very precise ideas about it. This attitude was no exception. Other male letter writers also knew more or less exactly how they expected their children's lives to proceed, and they also knew what role they expected their wives to take in this important matter. 7.4.40 I would like to take this opportunity to add once again that I am asking you kindly to fulfil my deepest wish to raise our child yourself throughout his teen-age years and to take it very seriously. If your job will not permit you to do so, then please get enough money together to send him to a good boarding house throughout his entire school years until he has his A-levels exam. And if it is a boy, please ensure that he gets a university degree so that he can attain a good profession, as his father desired. Please use all of your mother love to bring this sacrifice. It is my greatest wish. - And please tell him about us, about our happy life together, and as much as it is possible, please try as a mother to influence him to become happy and to emulate our love: Pure and unconditionally, for us mortals perfect in his greatness and eminence. - I hope that you understand my last lines as they were intended and that they will not make you sad. Sometimes it is necessary to have such thoughts, even if their content will never be fulfilled - think of our good angel. Almost as in his last will and testament, the writer here described his expectations. He expected to maintain his dominant role even after death. The women's wishes pertained to details and concrete conditions, whereas the men's expectations dealt with more basic and longer-term goals. Self-initiative can be seen here. The young woman had received the address from a roommate and while maintaining a certain amount of distance, got up her courage to write a few words and mail them. There are also examples known of soldiers who, being sent to the front, wrote their name and Feldpost number on a slip of paper and then threw the slips of paper out of the windows of trains going through towns. The young women collected these slips of paper and used them to start a correspondence. In reply to your request we are sending you the address of a soldier at the front who has indicated he would like to receive mail from home. Herewith we are passing the care of this soldier on to you. The name and rank of a soldier, as well as his Feldpost number, appear in handwriting in the proper position on the printed form. The Feldpost number was sufficient for identifying the address of the soldier. Nothing more was necessary. The National Women's Organisation was a sub-organisation of the Nationalist Socialist Party (NSDAP). Thus, the political leadership was directly involved with the initiation of partnerships. One can suspect a simple motive here: soldiers who have an emotional attachment to home will fight more intensively and with more commitment for the home front. Lovers and fathers are bad soldiers if they only want one thing: to go home. This is a contradiction to the effect desired by the political leadership. The content of the letters indicates clearly that the separation was experienced as being unpleasant. The conviction to support the Fuehrer, Volk and Fatherland unconditionally and to the end stands in opposition to the feelings expressed in the letters. Fathers often write of their longing for home. In spite of that - and it is important not to forget this -there are differences between thinking, feeling and acting. The soldiers' moods certainly had little influence on the outcome of the war. Decisions were not based on their free will. They had to fight, whether they wanted to or not. The flight of the bullet was not influenced by the emotional conditions under which it was shot. The effects of the moods have not been analysed enough to make any concluding assessment here. Feldpost communication and its media-specific conditions led to idealised images of the partner and the relationship. The resulting expectations could certainly not always be fulfilled. It was only in the case of death that the images did not need to be revised. Irene Guicking, whose letters have repeatedly been quoted here, confirmed this phenomenon in a conversation with me, "When my husband came home on leave, it took awhile, before we could relate to each other again. We had to renew our acquaintance with each other." The real man and the idealised correspondent were two different people. When Ernst Guicking died in 1996, his wife Irene opened the drawer containing their entire war correspondence for the first time since the end of the war, and began to read the letters again. For her it was a comparable situation. Separated from her husband, the letter was the medium uniting the two. Letters overcome any distance to create closeness. Her experience with her renewed reception of the letters was so intense that Irene Guicking decided to have the letters transcribed and turned over to the public. Today we can read them and learn many important and intimate things about a time period whose inner emotional life would otherwise remain unknown.